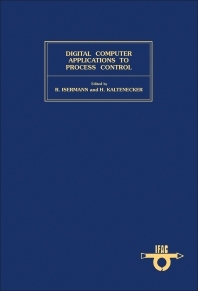 Digital Computer Applications to Process Control presents the developments in the application of digital computers to the control of technical processes. This book discusses the control principles and includes as well direct feedback and feed forward control as monitoring and optimization of technical processes. Organized into five parts encompassing 77 chapters, this book begins with an overview of the two categories of microprocessor systems. This text then discusses the concept of a sensor controlled robot that adapts to any task, assures product quality, and eliminates machine tending labor. Other chapters consider the ergonomic adaptation of the human operator's working conditions to his abilities. This book discusses as well the self-tuning regulator for liquid level in the acetic acid evaporator and its actual performance in production. The final chapter deals with algebraic method for deadbeat control of multivariable linear time-invariant continuous systems. This book is a valuable resource for electrical and control engineers.